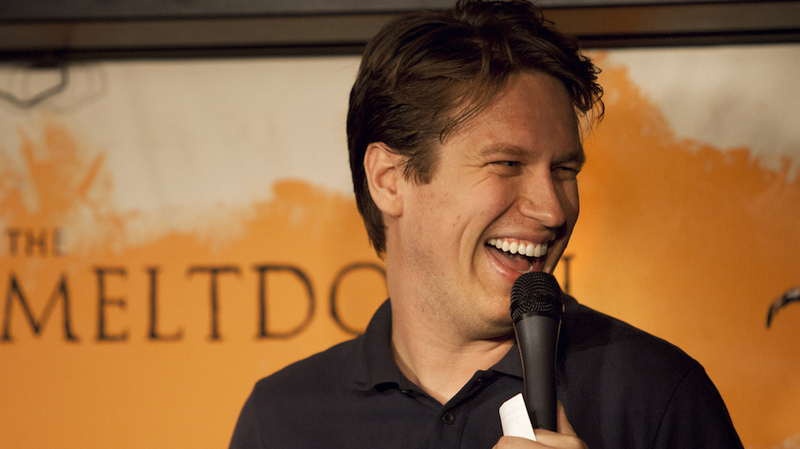 Pete Holmes, will you be my friend? Dave and I walked Nora to school this morning. Or more accurately, she delighted us as she skipped and sang to herself and we watched from a few sidewalk squares behind. We all high-fived at the steps in front of the school and then Dave and I walked home. When we got back and climbed our front yard hill I started pulling weeds. Dave had his travel mug with him so he sat down for a little while to finish his coffee and keep me company. He’s not into weeding. Dave started talking about this podcast he’s really into with Pete Holmes, called You Made it Weird. Pete interviews all sorts of interesting people: comedians, scientists, spiritual types, and it’s great because the interviews have the feel of a wonderful conversation with your most interesting friend. When I listen, I think it’s so good and real and funny that I actually notice a physical longing to have Pete as my friend. That’s how good it is. Dave is a loyal listener and as much as he talks about it, I don’t think he ever misses a podcast. Every once-in-a-while, Pete will interview someone who has an interesting spiritual perspective or story or experience and Dave saves those for me and plays them when we are painting a room or on a long drive. I always love them. He knows me so well. The episodes I enjoy are like a modern, first person account of The Varieties of Religious Experience. This book presents a really fascinating look at personal spirituality by the influential philosopher and “Father of American Psychology,” William James. Like the accounts in the book, Pete’s interviewees openly share their experience with religion or God, meditation or psychedelics, addiction or getting clean, or whatever else has been a part of their personal spiritual journey. I’m moved by the conversations because even when the details are different, I can still see the common threads from my own experience. I can relate to the ups and downs and the mystery of the whole process. And maybe at level that isn’t intellectual, I’m just amazed when I listen to one of these people articulate something that I was sure was only happening to me. I find it very comforting. The shared experience is significant because as far as I can tell, one’s spiritual path is essentially personal and individual. Even when there is community and support, even with guides and with the wonderful sacred texts that keep us company along the way, the work and the path is really up to each of us to do on our own. It’s between you and whatever bigger force you’re connecting to. But I like these reminders that it isn’t done in isolation. And the feeling that I am not the only one. When I listening to other people share their experience is like I’m getting a great big spiritual-journey hug. Consider this a big hug from me to you.